Been asked to look into some SQL Anywhere queries that have been performing poorly. Unfortunately, I have no experience with SQL Anywhere, more experience with Oracle. My question is, in SQL Anywhere, is it good practice to index foreign key columns if they don't reference such low cardinality columns as status and types? From what I see on some of the queries that I'm looking at, in cases there are several tables joined but the foreign keys are not indexed. 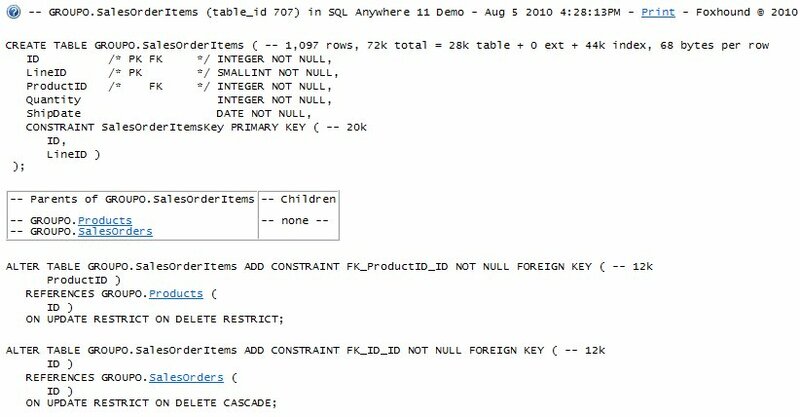 Unlike other DBMS software, SQL Anywhere automatically creates indexes on foreign keys, and the query optimizer uses those indexes when joining table IF (and it is a big IF) the indexes will make the query go faster. Please tell us what version of SQL Anywhere you are using. Unfortunately the version of SQL Anywhere is version 7.0! And they tell me there's no intentions to upgrade. Breck, would the case of indices being automatically created when foreign keys are created be apart of SQL Anywhere 7.0 by chance? SQL Anywhere's referential integrity checks rely on these indices to check efficiently whether each child record has a fitting "parent row". Versions 5 and 6 created funky combined indexes for primary and foreign keys, but with versions 7 and later the situation was greatly improved by creating a separate index for each primary key, foreign key and UNIQUE constraint. If you have multiple columns in your primary keys, there MAY be an advantage in creating separate secondary indexes depending on your needs (different column ordering, different column sorting, etc). In previous releases, primary and foreign keys have had a single index automatically associated with them, which describes all primary key values and all the related foreign key entries. In some situations, this architecture lead to poor performance. The new index organization separates these indexes, which leads to improved performance in some situations. For more information on key indexes, see Using keys to improve query performance. Your database must be unloaded and reloaded to take advantage of variable hash size indexes, and separate key indexes. Running the Upgrade [dbupgrad] utility is not sufficient. In Sybase Central you can try the Application Profiling, it will provide you after analyzing the workload with index recommendations if the indexes would improve the workload. Or in dbisql you can use the tools - index consultant for a similar recommendation. Yes, the "Index consultant" was introduced in v9. Sorry for the formatting! Of note, there is reference to a PRACTICE table with no joins to any other tables. At present there is only one record in that table. Your help is very much appreciated!!! Can you provide the CREATE TABLE statements for the tables, and the row counts? Would it make any difference if you rewrite the FROM/WHERE clauses with INNER / OUTER joins instead of WHERE conditions and T-SQL star joins? I think there is a way in Sybase Central to capture or export schema, but maybe not in V7. The dbunload.exe utility with the -n option will dump the schema for the entire database into a reload.sql file from which you can copy and paste.